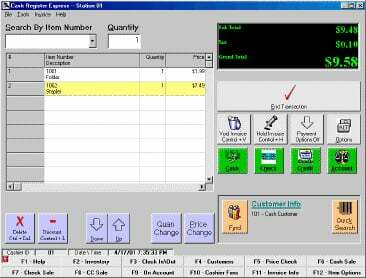 Cash Register Express - Latest Version, Enterprise Edition. Priced per station - call for quantity purchases. To be used for businesses with multiple physical locations (multi-store operation). Barcode printing BCE license module is included. Increase your profits by computerizing your store. Cash Register Express is a cost effective way to keep your inventory costs down, reduce theft and make more money! Cash Register Express is the first Windows based POS system exclusively for retail and video stores. Its easy to use interface makes it a breeze to manage your store. Tracking sales and inventory, renting videos and equipment, creating membership accounts, look-ups by category, and managing your store's books are just a few of the features of Cash Register Express! The Cash Register Express CREENT is also known as Cash-Register-Express	CREENT	.